This couple holds a place near and dear to my heart. This is Valentina and Mike, their wedding was held at the beautiful Floral Terrace. Valentina had total faith in us and when asked what type of wedding photos would you like, her response was "I love everything you do, do what you do". This is the response every Long Island Wedding Photographer wants to hear. This lets us have total creative freedom and really lets us run free and be as creative as we want to be. 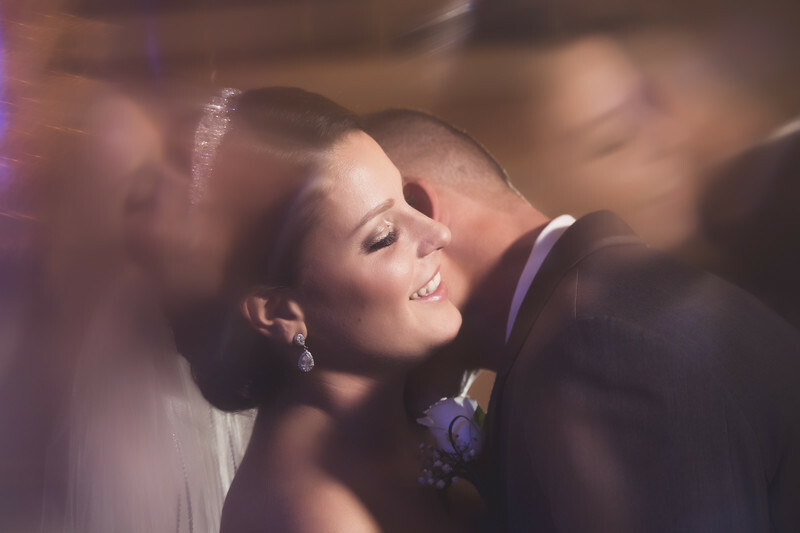 This creative Long Island Wedding Photo was taken right outside of the main ball room on the 3rd floor. The light from the chandler was just perfect and we wanted to show the connection between this beautiful couple. I love the reflections of Valentina's face, her smile and expression as the groom kisses her neck is perfect. If you like this creative image taken at Floral Terrace, I suggest you check out our Floral Terrace Gallery. Location: 250 Jericho Turnpike, Floral Park, NY 11001. 1/125; f/4.0; ISO 1600; 122.0 mm.